Once fuel leaves the refinery gate, the next step in the price chain is the wholesale rack. NYMEX: This is the first step in our fuel pricing structure – a mostly electronic platform exchange, where paper contracts of fuel are bought and sold for a period in the future. Hardly any physical barrels ever change hands. It’s a transparent market, giving buyers and sellers a visible starting point for fuel supply agreements. Need a full recap of the NYMEX? Click here. Spot Market: Spot purchases refer to commodities physically traded either on a pipeline or via barge or cargo. You negotiate for the fuel “on the spot” at the refinery gate or at one of the seven major refining hubs. Spot transactions are large – pipeline deals are a minimum of 5,000 barrels (210,000 gallons) up to 50,000 barrels (2.1 million gallons). Basis: Spot transactions for refined products are not done on a “flat price” basis (i.e. $2.00/gallon). They are done as a relationship to a related commodity on the NYMEX. That relationship is called a “differential” to the “cost basis,” which, in this case, is the NYMEX. Need a refresher on the spot market and basis? Click here. Basis differentials react to news as well. Gulf Coast spot differentials can “blow out” if there is, say, a fire at a Houston refinery. The differential to the NYMEX strengthens and spot prices rise independently of the NYMEX move. The next link in the price influence chain is the wholesale rack. Spots have direct impact on rack prices. What is a Wholesale Rack? A rack is a fuel distribution point – usually along a pipeline – where fuel is supplied. 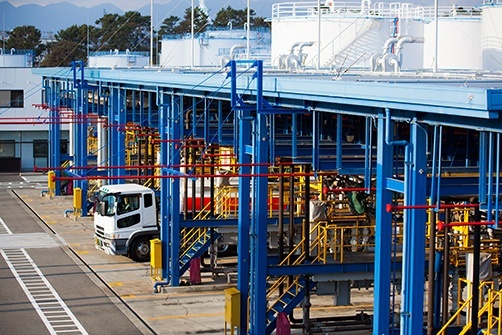 We call it a “rack,” because trucks pull up to an actual loading rack to receive fuel from their fuel suppliers. There are approximately 400 racks in the United States – 220 or so are on pipelines, and the rest are not. Unlike spot transactions, which, as we noted, are above are 10,000 – 50,000 barrels, these are typically “truck and trailer” quantity, or approximately 8,000 gallons. Who Pulls Fuel from a Rack? Some of these customers own their own trucks to transport the fuel or they may hire common carriers to do it for them. They either take the fuel to their own bulk storage facility or to their own retail outlets. Imagine you are a refiner. You produce gasoline at your facility and then put it into a pipeline to send “downstream,” where wholesalers, jobbers and end users buy it at a wholesale rack. Now, imagine you have a fire at your refinery that causes you to make less mogas. How do you make up the difference? Remember, you, as the refiner, have fuel contracts that you have to honor. So, you’re in a real pickle – you need to make up lost production. You have to go out and replace those barrels through purchases in the spot market. Refiners view spot barrels as “replacement barrels.” They view spot prices (remember, NYMEX +/- differential = price) as “spot replacement costs” – what it would cost them on any given day if they had to go into the market to buy lost supply. A refiner’s calculated spot replacement cost changes every day based on the movement of the NYMEX and the corresponding movement in the spot market. They track that fluctuating cost throughout the day – every day. Refiners increase or decrease their daily rack costs based on the average daily change in their spot replacement cost. That’s why rack prices move up and down! Note! It's worth keeping an eye on the spot market to see how rack prices will react to big moves. Find out how, here. Atlanta is served by the Gulf Coast spot market. Let’s say today’s average spot price (remember, NYMEX +/- differential = price) for Gulf Coast ultra-low sulfur diesel is $1.58/gal. To get the diesel from the Gulf Coast to Atlanta costs a shipper approximately $.0325/gal. Various other charges amount to $.0125/gal. That means that the refiner’s total cost to get the diesel from their refinery to the Atlanta rack is $1.625/gal. Now, let’s say a day later the cost at the Gulf Coast rises from $1.58/gal to $1.63 / gal – a 5ct gal jump. Using the same math as we did above, the “spot replacement” cost jumped from $1.625 / gallon yesterday to $1.675 today. You can bet that refiners (who look at the spot market all day) are not going to “eat” those 5cts/gal. They are going to raise their rack prices by some, or all of it, to absorb the change in their market cost. That increase is going to take effect sometime around 6pm local time at the corresponding rack. So, Can I Do This Math For EVERY Rack In The U.S.? Approximately 220 racks link back directly to one of the seven U.S. spot markets. Rack markets such as Salt Lake City, Boise, Cheyenne, as well as locations in Kentucky and Tennessee do not tie cleanly to a spot market, because they don’t sit directly on a pipeline. These markets have their own unique economics that refiners consider when adjusting rack prices. Fuel has to be moved via alternate methods (trucking, water) from one rack to another. Some markets (like Baltimore) can even be tied to two different spot markets. But refiners chart most racks back to one of the seven spot markets, using that simple spot + freight + other equation. The only charges included in a rack price are the charges that are incurred transporting the fuel from the refinery to the distribution rack. Rack prices do not include taxes or freight charges to carry the fuel from the rack to the retail station. The products sold at the rack include most grades of gasoline, distillate, biodiesel, pure ethanol and, in some cases, jet fuel. Imagine walking into a Baskin Robbins and just asking for “ice cream.” The server will look at you like you’re nuts. What kind of ice cream? It’s the same deal with fuel – there are now “31 Flavors” of fuel sold at the rack. Fuels vary depending upon the rack and what fuels are mandated in that state or county. For example, many parts of the United States have been deemed particularly high in pollutants – those areas are deemed “non attainment” and are required by the EPA to have “reformulated gasoline.” That’s a special flavor. Spot replacement costs vary depending on the fuel. 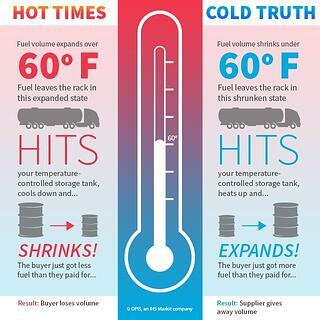 So, to truly anticipate rack price changes accurately, it’s critical to know which fuel is required in your market, so you know what spot market to keep an eye on. Having a Fuel Spec Book is critical, especially if you buy, or sell fuel in multiple geographic areas. That’s because fuel is not “fungible,” meaning there’s little or no interchangeability in the market. There are about 400 racks in the United States, where jobbers, retailers and end users pull truck-sized fuel volume to take to storage facilities or retail outlets. Price changes, which go into effect at 6pm each day, are based on “spot replacement costs,” meaning spot + freight + other costs. It’s critical to know what type of fuel is required in your particular region so you know what spot prices to track as you keep an eye on spot replacement costs – not to mention making sure you are pulling the right fuel at the rack. We are almost at the end of the fuel influence chain. Our journey will wrap up with the retail market.